If You Want to Protest, Hire Zombies | We Zombie! Lately it seems that in order to protest, we have to dress like zombies. I didn’t see any vampires protesting years ago when vampires were the rage. That’s right, I said the rage. I think zombies help make a point if you’re protesting about something that might kill you – like tobacco or nuclear waste, you know, saying this is what death looks like. But because they are so popular now, zombies seem to be a good tool to get attention. Also, it’s very easy to tie in the undead theme into most issues, as witnessed in the news articles below. The Oakland Library in California used zombies to protest, but at least they tried to tie in the zombie theme to the protests. 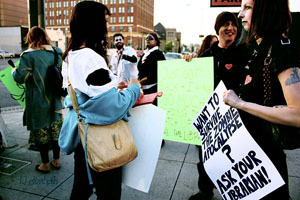 Amy Martin of the library, remarking on the proposal to close 14 of the 18 libraries said “It would pretty much decimate the library system, and we think that would be the end of the world so we’re coming out to say zombies support the Oakland Public Library“. They also felt that zombies wanted well developed brains, so they had clever signs like “Save the brains! Don’t close the libraries!” Very clever. By the way, just yesterday, the Oakland City Council approved a budget to keep the libraries open. Zombies were used to protest the governor of Wisconsin’s budget policies at an event where he was speaking to congratulate some Special Olympics winners. Some felt that the protest was disrespectful because they blocked the Olympian’s view of Governor Scott Walker, who was congratulating them. On the same day, June 8th, in the same state, twelve zombie protesters were arrested for refusing to leave the office of Wisconsin Representative Robin Vos, the Republican co-chair of the Legislature’s budget-writing committee. Vos wasn’t there at the time, and apparently the protesters were carried out of the lawmaker’s office one-by-one after they had spent about a half-hour in the lawmaker’s office. Also last month, about three thousand student demonstrators in Chile dressed as zombies and danced to Michael Jackson’s “Thriller” to demand higher education reforms, in front of La Moneda presidential palace, claiming that the current education system is dead. Check out the barking dogs being led into the fray in the middle of the dance – brings atmosphere. In another June protest, citizens dressed as zombies took to the streets of downtown San Jose, claiming that the city is creating a class of “working dead” because of their union negotiation tactics. Many of the zombies camped out overnight to assure that they had a front seat at the morning’s city council meeting. This entry was posted in Commentary, News/Events. Bookmark the permalink.